Campion's Exolorer 682 Sport Cabin goes the distance for family fun. 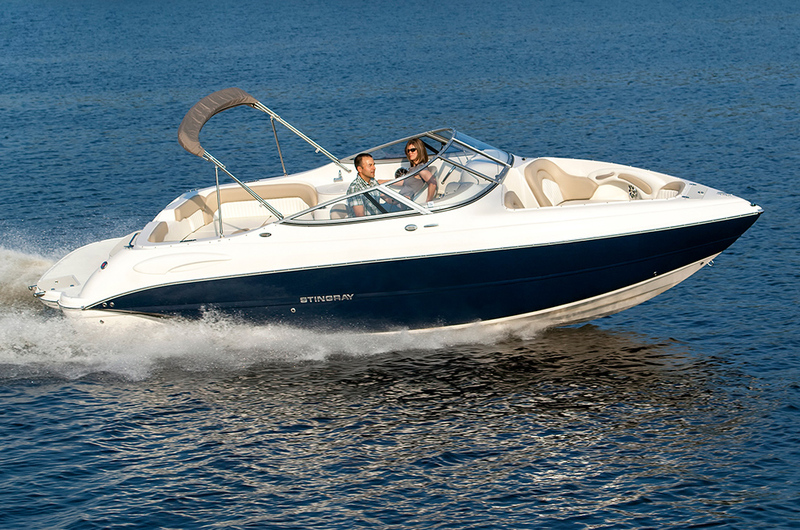 A practical cockpit layout and luxurious cabin make this sport utility a remarkably versatile boat. Head seas, following seas, quartering seas — the all-new Campion Explorer 682 Sport Cabin has been designed to handle all conditions with ease, thanks to its innovative APEX hull with Kevlar laminate reinforcement along the keel. While being able to rough it is important, if you're like most boaters, most of your "cruise" time will be spent anchored in a sheltered cove or docked overnight at a marina. This is where the amenities of the Explorer 682 come in handy. 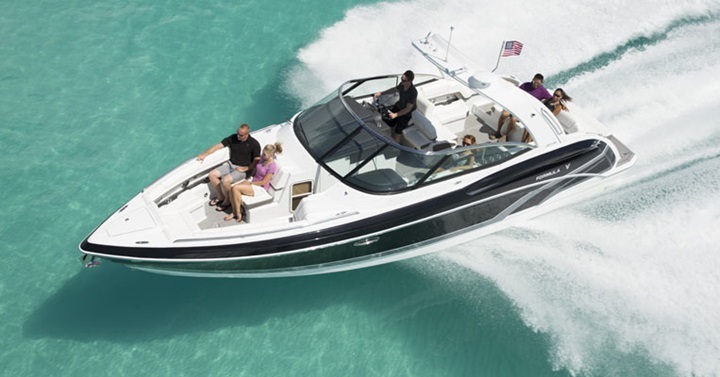 A practical cockpit layout and luxurious cabin make this sport utility a remarkably versatile boat, providing active families unlimited opportunities for adventure. To test the Explorer 682 Sport Cabin, Go Boating's test team set out on its own little adventure to Okanagan Lake, British Columbia, which is about a five-hour drive from Vancouver. Stretching 80 miles, from Penticton in the south to Vernon in the north, Okanagan Lake is touted as one of British Columbia's most popular summer recreational hot spots. 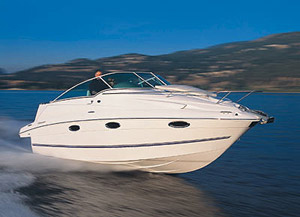 At its halfway point lies the city of Kelowna, a top tourist destination and home to Campion Marine Inc. Established in 1974 by Gordon Elliott and the father-and-son team of Ross and Rex Jardine, Campion Marine is still run by the Elliott family. The company has grown to become the largest independent boat builder in Canada. Campion has dealerships located in 30 countries worldwide. 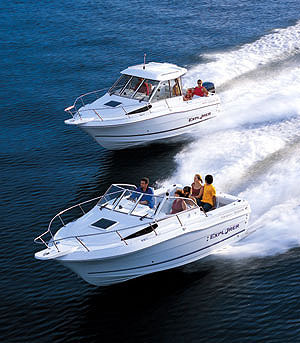 The Campion family of boats includes runabouts, express cruisers and luxury sport utilities. Brand new for the 2002 model year, the Explorer 682 replaces the 672 sport "ute," which featured a conventional deep-V hull. In recent years, Campion has converted nearly its entire product line with its award-winning APEX hull. Campion calls its APEX (Advanced Pressure Expansion) Lift System new design technology for a V-bottom boat, and claims that it induces faster planing. According to the company, it also creates less wetted surface and a more stable platform at high speeds. We tested the Explorer 682i, which is powered by a stern drive, but the boat is also available with an outboard. However, with an outboard engine, the boat is given a new name: the Explorer 682 O/B Sport Cabin Bracket. Both applications have their advantages. Outboards generally weigh less than stern drives of similar power, are easier to access for maintenance and open up space in the aft cockpit, making them more practical for fishing. 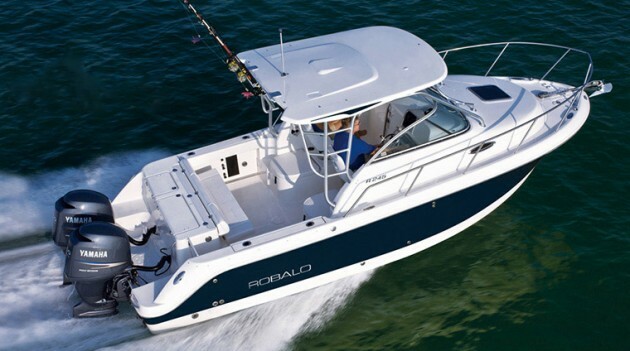 Comparatively, stern drives typically offer much better fuel efficiency than outboards and are much quieter since they are enclosed. Watersports enthusiasts also prefer a stern drive because of its rear weight bias, which produces large, fat wakes. Our test boat happened to be the stern drive model, which comes standard with a 5.0 liter engine, or you can choose from various optional power packages. 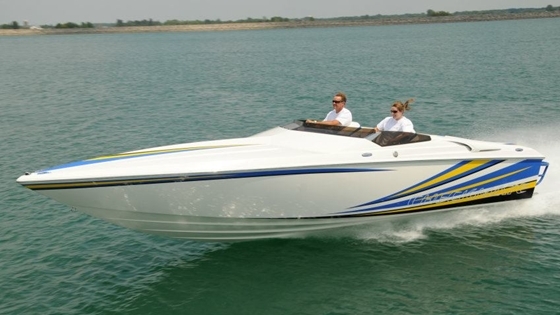 Ours was equipped with a 5.7 liter Volvo Penta GXi, which delivered a whopping 320 hp — the maximum allowed for this boat. The V-8 delivered powerful torque for instant holeshot and quick acceleration. With two adults aboard and a full gasoline tank, the boat reached a planing speed of 21 mph in 4.5 seconds, at 2,900 rpm, followed by a comfortable cruising speed of 26 mph, at 3,300 rpm. Breathtaking as it was, Okanagan Lake refused to cooperate with us on test day. Taunting us with its placid, mirror-like surface, the water offered up little chop to help us determine the softness of the APEX ride. Instead, we were forced to cross what little swell we could make with our test boat, and ultimately took advantage of the calm conditions by performing every high-speed maneuver we could think up. It was during a series of hard-over turns that we noticed a slight drop in rpm as we throttled up to maximum engine speed, but otherwise, the boat demonstrated excellent cornering ability, enabling us to spin a 360 tighter than Michelle Kwan on ice. The Explorer 682 boasts a generous 20 degree variable deadrise, which further enhances its ability to take on rough water. Practical features, such as heavy-duty windshield wipers, a rubber-coated Shurgrip steering wheel, a self-bailing fiberglass cockpit and an optional hardtop, help keep crew and passengers safe and comfortable in any weather. The stainless steel hardware on deck also gives the impression that the Explorer 682 can really look after itself offshore. In the Great White North, where wildlife runs as rampant as taxis in New York City, boats are often used for more than cocktail cruising. 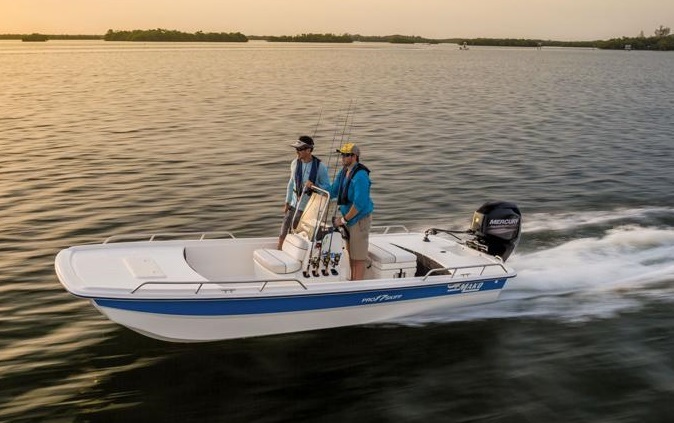 Thus, Campion added a healthy dose of fishing features to the Explorer 682, making it as much a mini-sportfisher as it is a high-performance family cruiser. There are separate tanks for keeping bait and the day's catch, gunnel rod storage, deck rod holders, a built-in tackle box and downrigger support brackets. An optional Fishing Package adds an aerated live well and bait tank, as well as a raw water washdown system for quick cleanups. Customizing is a major attraction on the Explorer 682. Several optional packages are available for adding anchoring gear, galley amenities, helm switches or creature comforts. Buyers can also pick and choose individual upgrades ? la carte, including a full-width swim platform with a three-step dive ladder, premium snap-in carpet and various cover options, to name just a few possibilities. However, you don't need to add anything to make this boat more liveable, as it already comes with an impressive list of standard features. Campion's exclusive Ergoform sleeper seats slide out for comfort and lift up for easy access to abundant storage. The swivel bucket captain's chair has a removable jump seat cushion behind. Inside the cabin is a galley with a sink, an ice box and a stove, a cozy berth with designer fabrics and ventilation through an opening deck hatch with a screen. Rugged enough for big water, yet comfortable enough for overnight cruising, the Explorer 682 Sport Cabin is a versatile adventurer. Whatever boating means to your family — an opportunity to fish, engage in watersports, cruise or just relax — they'll enjoy it to the fullest aboard this beautifully equipped luxury sport utility. Bore and stroke 4.00" x 3.48"